Yes, you read that right! My friend, Jessie, of Vintage Remedies fame…is giving away a Vita-Mix 5200 on her blog! Go enter to win! And spread the word! Ok, Sara. You’re always talking about this Vita-Mixy thing. What’s the deal? Well…the Vita-Mix is the “holy grail” of all blenders. With the blades traveling at 240 mph on a 2+ horsepower “engine”, you can blend pretty much anything…FAST. So, why do you need a Vita-Mix? Well, you don’t NEED it. BUT, if you’re serious about raw foods or you just want to be healthier, the Vita-Mix is a wonderful investment. I haven’t met one person who doesn’t love their Vita-Mix! Other blenders work “fine” for awhile, until you blend them too much and they start smoking. We decided that we would rather have ONE high-quality blender that was amazing (with a 7 year warranty), instead of buying one blender a year for 7 years. We haven’t once regretted our decision. 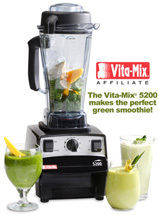 I use the Vita-Mix daily to blend my smoothies, make almond milk, nut butters, sauces, soups, ice creams, and more. If you like to make bread/muffins/pancakes, you can use the dry container to grind grain as well. If you’re interested in purchasing a new or refurbished Vita-Mix, check out my link in the upper right corner of the blog or click here. By using my affiliate link, you quality for FREE standard shipping. There is a 30 day money back guarantee…so you have nothing to lose! Entry filed under: Raw, Vita-Mix. Drinking Plant Blood	What’s In YOUR Fridge? i need one of these SO bad – my super old cuisinart barely blends ANYTHING anymore. it takes like 15 minutes to blend my green smoothies… thanks for telling us about it! You definitley won’t be dissapointed if you buy a vitamix. You have to consider it a investment because the vitamix will last forever and it is so versatile.